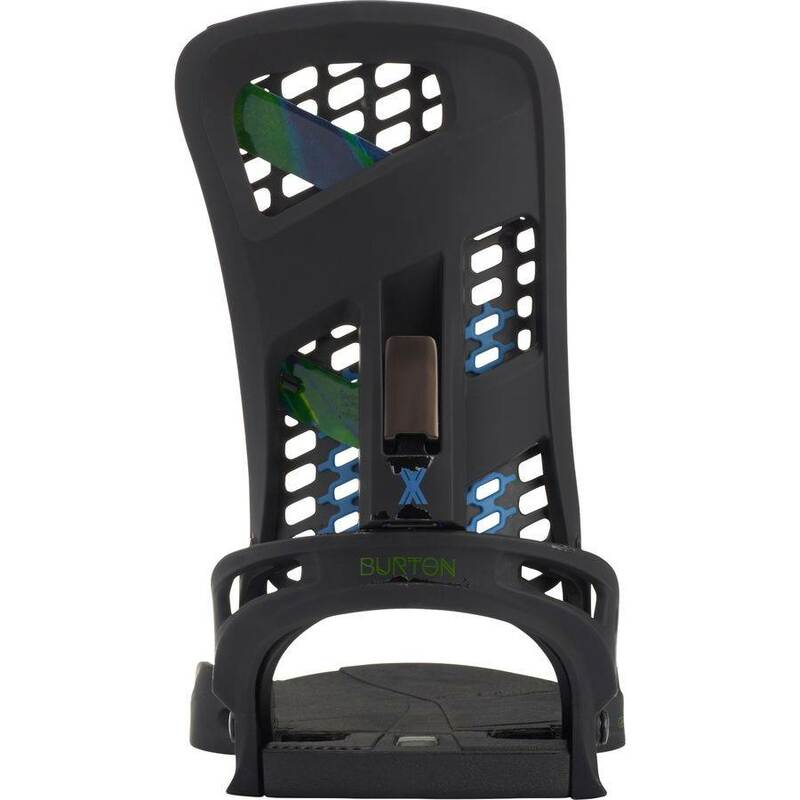 The 2019 Burton Genesis X is very similar to the 2017-2018 model but it has a new toe strap that we personally felt fit a lot better than the older toe strap. Also, it has Auto-Cant back in the binding which is a subtle way of relieving pressure on the hips, knee, and ankles. 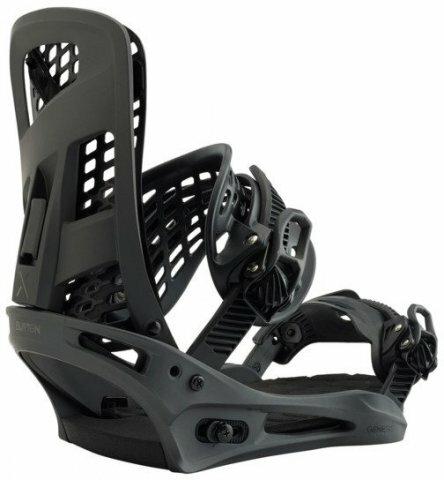 So if you are looking to buy a Burton Genesis X, every year made a good binding but the best years are 2016 and 2019. Days: Only a few on the 2019 but many many many days on 2018, 2017 and 2016 models. Highback Flex: The highback comes in two parts. The back part is thin but really stiff for what it is. 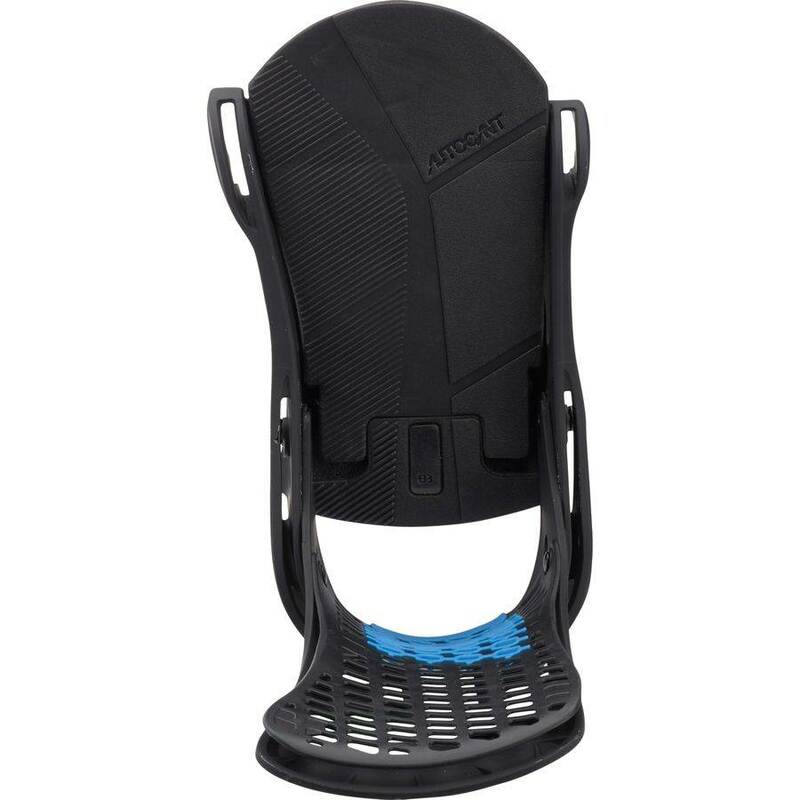 Then there is a softer plastic/rubber hammock that acts as a barrier between the stiff high back and your boot/calf. This combo makes it feel like it’s not a stiff calf biting binding when in reality it is. 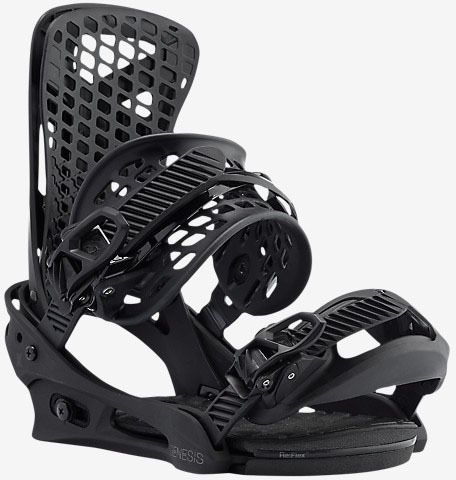 Binding Adjustability: You can adjust the toe ramp to adequately dial out the boot to fit center in the binding and therefore the board but it isn’t perfect. It works for most sizes except for the in-between sizes at the ends of the recommended sizing spectrum. Where Burton really shines is highback rotation, Ankle strap angles and forward lean. Most companies don’t pay much attention to ankle strap adjustability so even having two options is great. They are also really good when it comes to adjusting the straps with a tool or toolless. I love that you have both options. Stance Width Adjustability: Non-existent. You can’t turn the bindins’ discs sideways and move the bindings from tip to tail like you can with almost every other company. This is the price you pay for that amazing flex underfoot with the Re:Flex tech. Comfort: Incredibly comfortable. Some, like myself, like the Malavita and X-Base ankle, strap better and feel it has fewer pressure points but this is really comfortable too. It’s hard to complain. Boot Support: The big ankle strap and new toe strap really support your whole boot/foot and it is one of the best out there in giving you support without feeling like you are hard booting. Turn Initiation: The Burton Genesis X offers up a smooth but responsive transition from edge to edge. Buttering: Incredible butterer. It gives you a response and butter ability which is hard to do. Ratchet System: Some of the smoothest ratchets in the business. Shock Absorption: Really good shock absorption that is very damp at high speeds but also great on a flat landing. 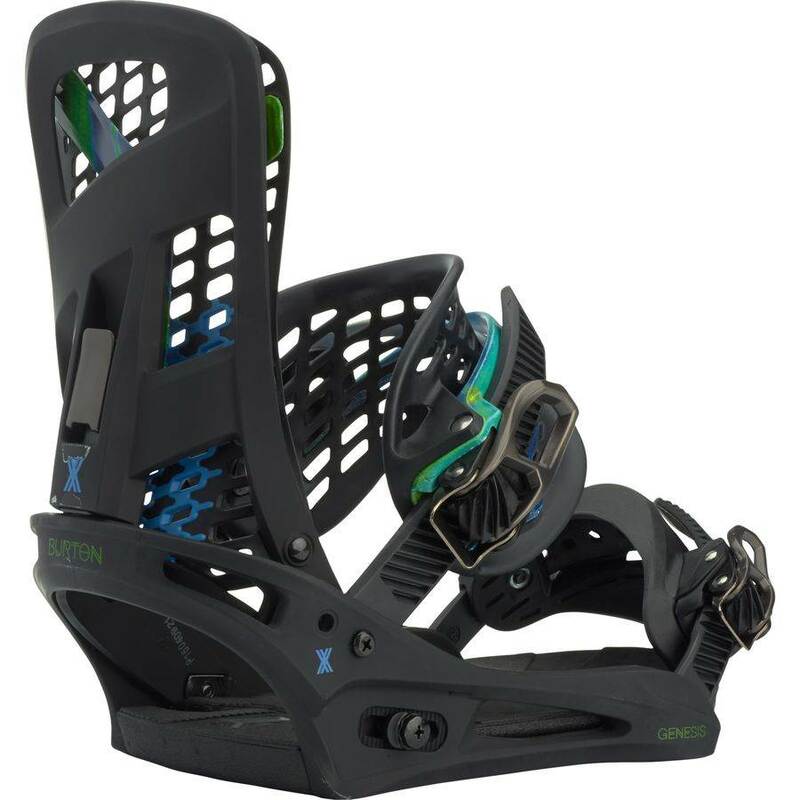 So to us, The Burton Genesis X is one of the best bindings out there for those that want med/fast response, excellent shock absorption, joint pressure relief (for most), excellent high back rotation and butter ability all in the same package. If you can get past the stance width adjustability issue for traditional insert boards then you have an amazing binding. The Burton Genesis X Snowboard Binding offers up a stiffer version of the Genesis. It’s a binding we didn’t think made sense at first but after riding it we wanted it in our quiver. Making that dual layer high back stiffer really makes the now discontinued Diode feel obsolete. The 2017 Burton Genesis X is almost the same as the 2016 Burton Genesis X except it seems that the Autocant tech has been removed this year. We liked the Auto-Cant tech from the 2016 model and would like to see it back. There was no change between the 2017 and 2018 Burton Genesis X so the old review still stands. Boards: Rome Powder Division 157, Yes Optimistic 2016 and 2017, Yes Pick Your Line, Jones Ultra Mountain Twin, Jones Flagship, Jones Hovercraft, Loaded Algernon, Rossignol One Magtek, Rossignol XV, Burton Flight Attendant, Capita Mercury, Capita Spring Break, Gentemstick Stingray, Never Summer West, and many more. Flex: This flex is stiff in the high back and base plate compared to the Genesis. It’s a got a stiff feel but that hammock in the high back make it feel like there isn’t a stiff high back biting through your boot into the back of your calve. 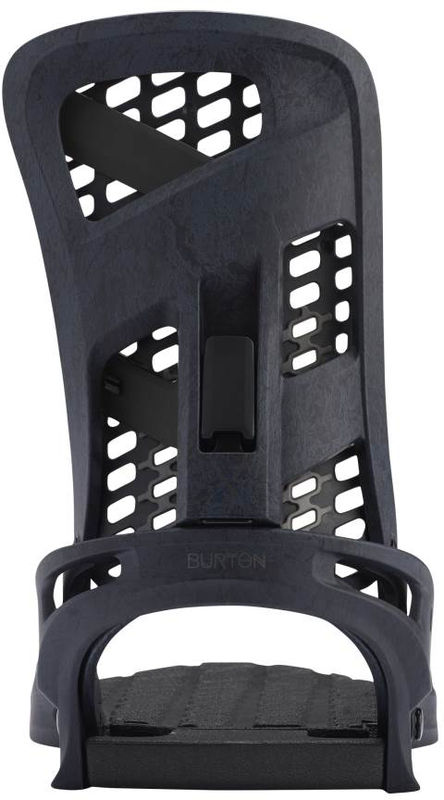 Adjustability: Burton does a good job with making a binding conform to your boot. The only minor issue is the gas pedal is the only part that can adjust for boot size. Another issue is with Re:Flex bindings and normal non-EST/Channel System boards are the Disc only slides one hole from toe to heel. Most discs allow you to slide more each way but even more importantly it won’t allow you to turn it sideways to slide from tip to tail. That means you can’t dial out your stance width as easy as you would like for boards you would like to center up when riding on groomer days and set back on powder days with your perfect stance width. Turn Initiation: Love the smooth but pretty dynamic spring from edge to edge. The hammock in the high back feels like it makes the ride a little damper but also gives it a little more spring out of the turn. It’s not the fastest edge to edge in the industry but it does make the board feel a little softer underfoot and easier to turn. Still, it’s a nice step up from the Genesis and Cartel. 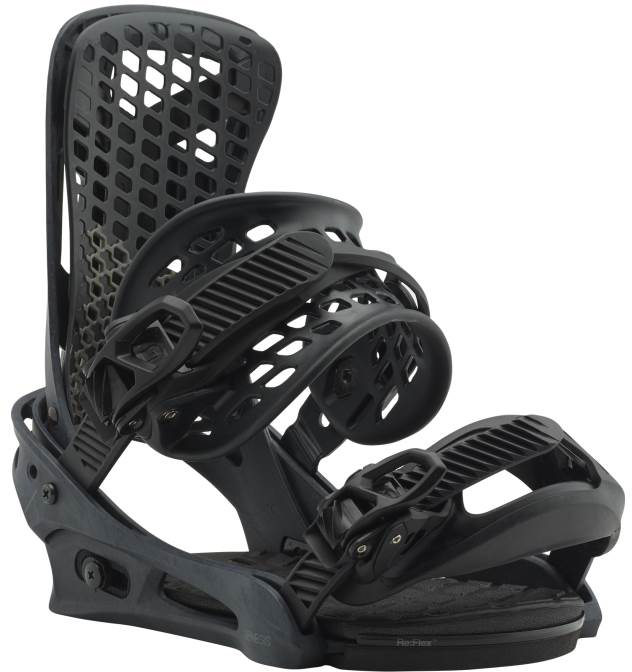 Buttering: For a binding this stiff The Burton Genesis X is really easy to butter. It’s just like the Genesis when it comes to this and makes boards underfoot feel a little softer and easier to butter. Boot Support: So the ankle strap wraps well around the ankle and it’s very supportive. You can move the ankle strap up one notch to make it sit higher on your ankle giving you better support. The toe strap sticks well and doesn’t come loose like the old straps but it never sits on the toe very well and takes a little time to line up correctly. Still, it pulls the boot well into the high back. 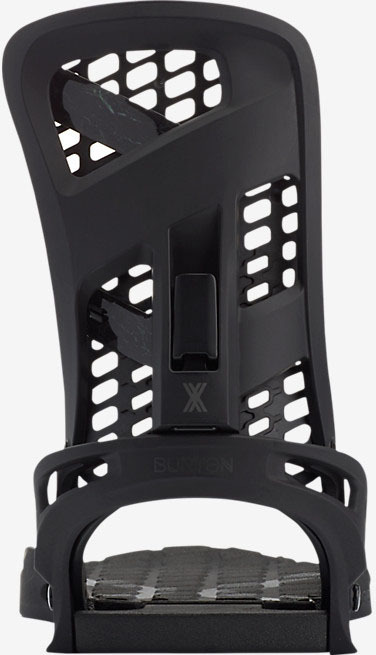 The 2019 Burton Custom X toe strap is the best we feel Burton has made to date and it works really well. It is super easy to line up and fits on the boot really well. Ratchet System: The Burton Genesis X is very smooth and easy on and off. It’s one of the best ratchets in the business and it is often what we compare many other ratchets too. Shock Absorption: It’s got lots of shock absorption in the heel and toe. Not as much on the arch where the disc is but it’s overall very damp where you need it. It’s not the dampest out there but it’s near the top of the damp chain for sure. Regarding sizing. 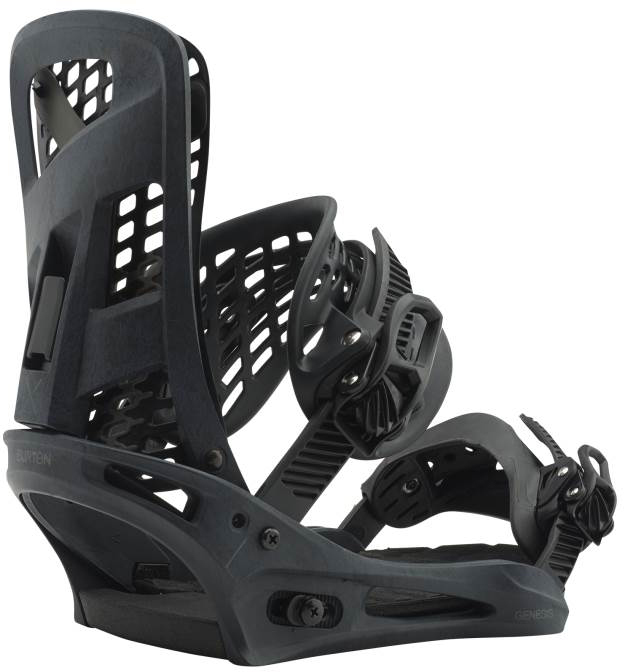 We feel the Burton Genesis X is best for size 8-10.5 Reduced footprint boots like Burton, Ride, and Adidas. Our friends with a reduced footprint 11’s just barely fit in so generally it’s better to size up to Large bindings. So overall the Burton Genesis X comes at a high price but if you can open up the wallet and let a lot of cash you have one of the better bindings we have come across. It’s not a bad choice for those that like the response of the Diode but want the Auto Cant tech and like the feel of the hammock in the high back. After about a week of riding the Genesis X and comparing it to the Diode it edged out the Diode as a Good Ride Favorite. I hope this sticks around in the coming seasons. Flex: Noticeably stiffer than the Genesis and feels slightly less stiff than the Diode. Adjustability: Same old Burton adjustability that works pretty well for dialing out the boot to the binding and your board. Comfort: Same great comfort as always and the straps are the same as the Diode and Genesis. Turn Initiation: Nice smooth but pretty quick turn initiation that gives you a little more speed edge to edge than the Genesis but just a slight bit behind the Diode in my opinion. Still it’s really close to the Diodes. Buttering: All three bindings really let the board flex exceptionally well under foot. Boot Support: Nice supportive straps and I really like the new softer all rubber toe strap. It holds the boot in place a little better than the older strap. Ratchet System: Very smooth and easy. Shock Absorption: Same upper tier shock absorption as you get from the Genesis and Diode. Love that mellow auto cant as well because it helps your body line up pretty easy to not cause joint pressure. Well at least it does that for me. We try to get as many images of the Burton Genesis X, but forgive us if they're not all there. I wanted to update my review directly below (Genesis X). 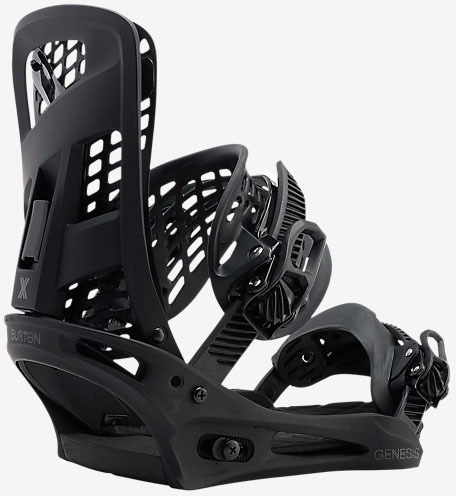 I need to drop them from 4 to 3 star after riding them in direct comparison with my new Rossi XV bindings. The bad: where do I start. After riding these back to back with the XV bindings I realized how slow these bindings actually are edge to edge. Burton rates them the same as the Cartel and Genesis for response (medium) and I would say I agree they are medium. Also, the flex slider (the thing that flops your ankle strap open) is more of a pain then an added bonus. The ankle strap falls into the stomp pad area so if you like stepping on your ankle strap when u get off the lift these are a good choice. Worst of all they're expensive. Comfortable bindings, but Re:Flex cushioning isn't that responsive. There's a tradeoff you get from that much cushioning. My knees are so much happier with these bindings over my Union's but I miss the response. Ankle strap 5 out of 5, toe strap 2 out of 5. The binding is outrageously expensive, but it shouldn't be. 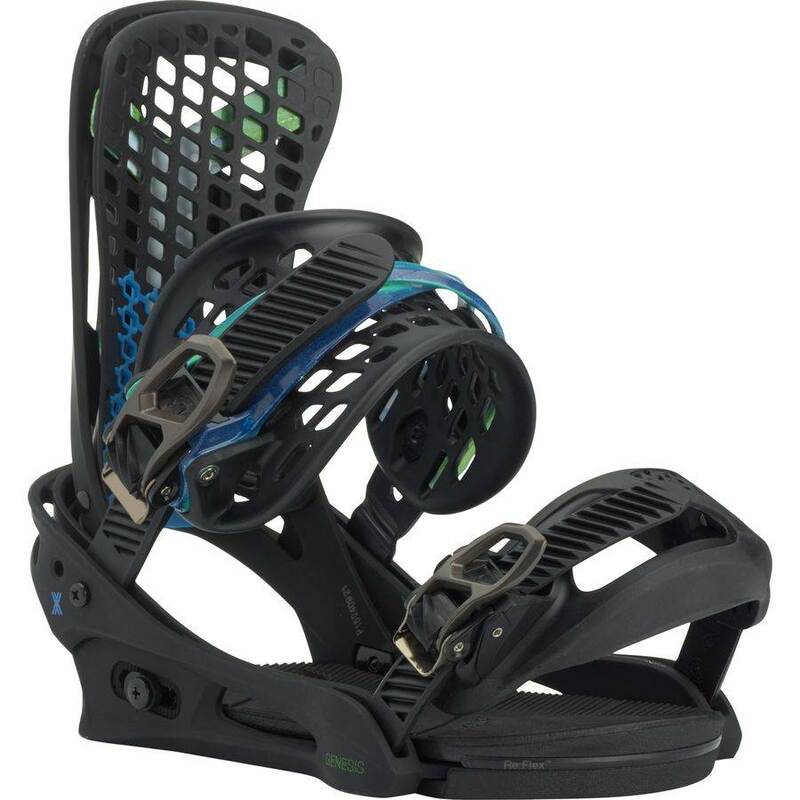 I had a pair of regular Genesis bindings that I got rid of because they were too kushy and not as responsive as I like, but I liked most everything else. Genesis X solved my complaints with shock absorption. Things I like: Responsiveness with just enough shock absorption, comfort of ankle strap, how locked in the ankle strap is, how well matched the ankle strap is to Burton boots, the ratchets, adjustability, and how damn light they are. Things I don't like: The price, the toe strap (works fine, but it seems like fitting a square peg into a round hole and takes longer than others to find the right place), the floppy ankle strap (I step on it getting off the lift all the time), disks that can't be turned sideways, and the lack of canting in the footbeds. Note that I just called Burton for the "tip to tail re-flex disks" and they are shipping them out for free, which was very nice of them. Last note, I find that the Large binding fits my size 11.5 boots almost perfectly with my main goal of having the bottom of the footbeds within a few mm of the edges of the board in order to transfer more force to the edges. Larger boots may have to keep heel to toe disks and offset from center.